We review the current generation of budget flash triggers: the Yongnuo RF-602, Pixel Soldier TF-372, Phottix Strato 4-in-1, Aputure Trigmaster and MeiKe MK-RC7. How do they compare? With so many new Chinese triggers coming on the market that are actually turning out to be a rather decent alternative to the big brands, which one should you buy? In the run up to Christmas we tested five sub-$100 eBay triggers in a bid to find the answer for you. Firstly, what am I going to be evaluating today? The RF-602 is arguably the benchmark by which all other budget flash triggers should be compared. They first came out in 2009 and offered something that its low budget predecessors could not: reliable triggering, without misfires, from close ranges all the way up to 100 metres and beyond. The low profile design means the receivers are stronger, keeping your speedlights are safer in the hotshoe, while the screw-lock connection gives added security when using cables, too. Unlike PocketWizards, you can use the system to wake up your flashes from sleep mode or to autofocus/meter your camera when used as a remote shutter release. I first got my own set of RF-602s a while back, having already gone through PT-04TMs and CTR-301/Ps. The latter kits were brilliant while they lasted, but each one eventually packed in or became unusable. While they sit in a landfill site somewhere, my RF-602s are still going strong and I’ve never had any problems with them. If it weren’t for this web site, I may never have looked at anything else after that. 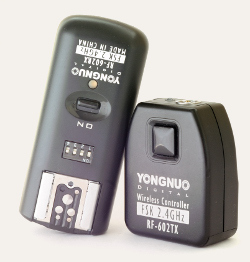 Yongnuo RF-602s are widely available on eBay and distributed in many countries. Some retailers, including the official eBay outlet, include a 12 month warranty. RF-602s are also known as Photoflex FlashFire (USA) and Fokon MR R-16 (Thailand). The Pixel Soldiers, released earlier this year, have a broadly similar feature set to the RF-602s with some design improvements. The main thing that sets them apart is Wireless Flash Grouping. In a nutshell, you can assign a receiver to one of three groups, A, B or C, while choosing from the transmitter which of seven combinations of these groups you’d like to trigger. It may sound mundane, but can save photographers a lot of time in complex lighting setups without having to go back and forth switching units on and off. The Pixel Soldier TF-37X series is available on eBay and some local stores. In the USA they are sold by CheetahStand. Phottix’s 2.4GHz Strato 4-in-1 (not to be confused with their earlier 433MHz Strato, a Yongnuo YN-16 clone) works very much like the other triggers in this review with a couple of significant additions. A hotshoe on top of the transmitter makes up for the one taken up on your camera. 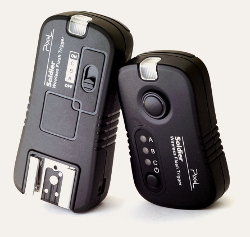 Thus you can use the Strato simultaneously with an on-camera flash or other hotshoe device, even another transmitter. As well as a wireless shutter release function, you can use the receivers on their own as wired remotes. 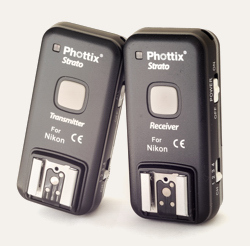 Phottix Stratos can be bought direct from the manufacturer in their online store. The Strato is also sold under the Calumet brand in Britain. Contact the company for other distributors. The only system not using the 2.4GHz worldwide frequency in this review, Aputure’s “Versatile Trigger” could be considered a throwback to cheap eBay remotes of the past. 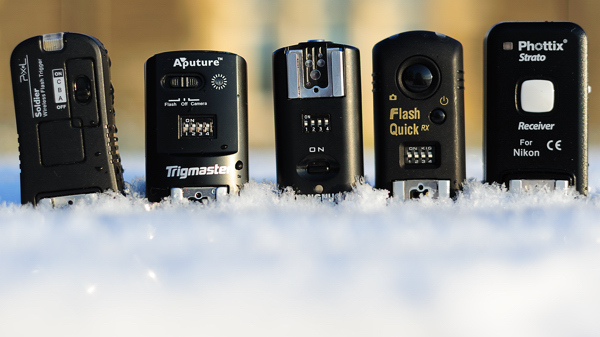 However, a shutter release function (including a 5s timer), transmitter on/off switch and 100 metre range are all big improvements over TrigMaster’s generic counterparts. The 433MHz frequency isn’t universal but can still be used in most of the world. 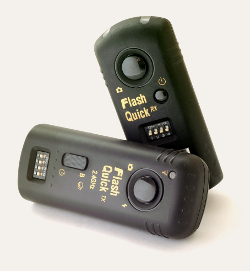 As a flash trigger, there is no wake-up function, but there is still a half-press feature when used as a shutter release. Aputure Trigmaster Versatile Triggers are available on eBay. At first glance, the MeiKe units look like some sort of cheaper RF-602 clone. Despite MeiKe’s relative obscurity compared to Yongnuo, there are some advantages in their system. 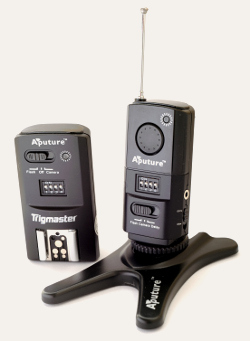 The transmitter uses easily found AAA batteries and has a locking mechanism to secure it to your camera hotshoe. In shutter release mode some photographers will appreciate the benefit of bulb support and a self-timer function, both of which the RF-602s lack. On the other hand, are they still as reliable? You can buy MeiKe MK-RC7 triggers from LinkDelight’s online store and on eBay.